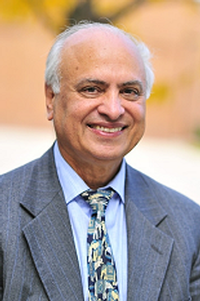 Dr. Inderjit Chopra is a Distinguished University Professor and Alfred Gessow Professor in Aerospace Engineering and Director of the Alfred Gessow Rotorcraft Center at the University of Maryland. Also, he was the Minta-Martin Research Professor from 1996 to 2000. Dr. Chopra completed B. Sc. Aeronautical Engineering from Punjab Engineering College, Chandigarh, India, in 1965. He passed M.E. with Distinction in Aeronautical Engineering, Thesis: “A Study of Some Problems in Panel Flutter“, from Indian Institute of Science, Bangalore, India in 1968. Dr. Chopra completed Sc. D. in Aeronautics & Astronautics, Thesis: “Nonlinear Dynamic Response of Wind Turbine Rotors“, from Massachusetts Institute of Technology in 1977. Then he joined the NASA Ames/ Stanford University Joint Institute of Aeronautics & Acoustics, where he worked for four and half years on the development of aeroelastic analyses and testing of advanced helicopter rotor systems. In 1981, he joined the University Maryland as an Associate Professor, and got promoted to Full Professor in 1986. Dr. Chopra has been working on various fundamental problems related to aeromechanics of helicopters including aeromechanical stability, active vibration control, modeling of composite blades, rotor head health monitoring, aeroelastic optimization, high advance ratio rotor, coupled rotor-body-engine dynamics, smart structures, swashplateless systems, micro air vehicles, and comprehensive aeromechanics analyses of bearingless, tilt-rotor, composite coupled, servo-flap, coaxial, compound, teetering and circulation control rotors. His direct graduate advising resulted over 50 Ph.D. and about 100 M.S. degrees, and his students are now playing important roles in rotorcraft industry, academia and federal labs. He acted as the Department Chairman from 1988-1990 and 2009-2010. Dr. Chopra’s professional interests include multidisciplinary research in rotorcraft aeromechanics with focus on structural dynamics, vibratory loads, aeroelasticity; smart structures; and micro air vehicles, with a balance between analysis and experimental testing. Dr. Chopra has been the principal investigator of six major research programs: Army/Navy/NASA’s “Vertical Lift Research Center of Excellence (VLRCOE)” (2011-21), Army’s CTA-MAST on “Center for Microsystem Mechanics” (2008-18), Army’s MURI on “Micro Hovering Air Vehicles: Revolutionary Concepts and Navigational Advancements” (2004-09), Army’s MURI on “Innovative Smart Technologies for Actively Controlled Jet-Smooth Rotorcraft” (1996-2001), Army’s “Rotary-Wing Center of Excellence” (1992-2006), Army’s URI on “Smart-Structures Technology: Innovations and Applications to Rotorcraft Systems” (1992-97). An author of over 200 archival journal papers and about 400 conference proceedings papers, Dr. Chopra has been an associate editor of the AIAA Journal of Aircraft (1987-cont. ), Journal of the American Helicopter Society (1987-91), Journal of Intelligent Material Systems and Structures (1997-2012), International Journal of Micro Air Vehicles (2014-cont. ), VERTICA (1987-91). Also, he has been a member of the editorial advisory board of five journals: International Journal of Aerospace Engineering (2007-09), Journal of Aircraft (2002-cont. ), SADHANA (1991-95), Smart Materials and Structures (1994-01), VERTICA (1987-91).